What a beautiful day for the 2016 Piedmont Bass Classics $10,000 Spring Team Bass Trail Championship at Jordan Lake out of Farrington Point Wildlife Ramp. The weather turned out great with air temps about 61 degrees in the am on up to 82 in the pm. Water temps averaged 83. Winds were around 5 in the am and blowing up to about 15 in the pm with some gusts up to 22 mph. 73 of the 81 qualified teams participated with 56 of them weighing in fish. The wind played a major factor in todays catch. It was tough on the anglers and trolling motor batteries!!! At the weighin we were treated to a great cookout and a word from God by Pastor Marc Francis of Ridgecrest Baptist Church in north Durham. Relatives and friends of the anglers were also involved in the cookout and door prize drawings. After that we had the door prize drawings and all anglers there received a door prize! 1st Place Team Tim Parker and Todd Massey won big weighing in 5 bass at 26.86 lbs. 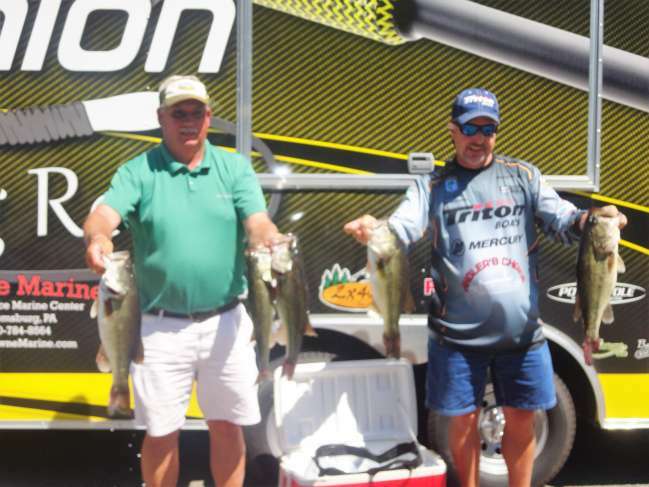 and along with the 1st place winnings of $10,010 in cash and prizes they won the 1st place TWT and also will receive a check from Triton Boats Gold Program for $7,000 for a total of $18,655 in winnings. Massey will also receive $100 from Tow Boats US Atlantic Coast Marine Group in Morehead City for being the highest finishing Tow Boats US member. Jaime Fajardo & Josh Hooks won 2nd place with 5 fish weighing 25.97 lbs. They also won 2nd Place TWT for a total of $2,005. 3rd Place Team, Billy Bledsoe & Brian McDonald, had 5 weighing 23.56 lbs. and along with 2nd Place Big Fish (8.15 lbs. ), they took home $1,233!! The 1st Place Big Fish (8.38lbs.) was caught by the team of Hunter & Terry Collins netting them $1.022. Larry Hipps and Dean Lairson edged out Mark Herndon and Jay Garrard by just 6 point to become the Spring Trail Points Champions and took home over $1,000 in cash and prizes along with trophies!! 219 fish were weighed in for a total of 690 pounds for an average of 3.15 lbs. each. Most of the fish were caught on WLS shaky heads, crankbaits, T-rigs, C-rigs and jigs in 8 to 20 feet of water or less. The deep water bite has started but don't pass up the early morning-late evening topwater bite!! 1st Place: ......Tim Parker & Todd Massey of Chapel Hill & New Hill...5 bass...26.86 lbs...$10,010 cash & prizes.